Won’t you agree with me if I say that content grew up a lot in 2018? If you just take a glance over the relevant stats of last five years then you would notice that content has gone a long way from just being a shiny new object’ in marketing to the one which is now taken as seriously as SEO, SEM, and social media. But, like any other digital marketing trends, content marketing is even constantly changing. We’ve seen over the time the trends like brands are turning into publishers, the emergence of video as a buzzing media etc. have become the significant parts of content marketing programme. Content marketing will become exclusively important. Content creation and distribution are supposed to change radically. There’s certainly a reason behind the statement of Seth Godin according to which content marketing is ‘the only marketing left’. Precisely, content marketing is something which is exceedingly authentic, useful, and of course simply perfect for the next internet generation!! However, let’s find out now how will be the picture for content marketing in the coming months of 2019? And, yes! Also beyond that…..
Personalization which is nothing but the one-to-one marketing is definitely the key to delivering some of the most astoundingly delightful customer experience. For example: You’ve just visited an e-commerce website and entered your name and email address to place an order. Next, if, by any chance, you simply just visit that website then you get greeted by your name. How would you feel? Also, assume that you are being shown with the same kind of things that you bought last time. Won’t it be something really superb? It will give you personal, and intimate experience while you’ll be experiencing the same kind of feel-good factor that you usually go-through when the receptionist at any hotel greet you by your name and usher you to your favorite table. So, it is being anticipated that in the rest of 2019 contents will be even more personalized for a better experience of readers. And, if you would opt for this trend then you will certainly stand-out in the sea of a ton of me-too competitors. According to a current research of 1,100 digital professionals, Monetate identified that 94% of them believed personalisation to be a ‘critical to current and future success’. Personalised lead nurturing has to lead to 20% of an increase in sales opportunities from sales. In another famous survey of Forrester, they revealed that 92% of the marketers consider are saying that interest in personalisation has increased exceedingly in their companies. As it has been said, “ Start narrow and grow wider”. No matter in whichever you belong to, you would definitely need to curate some quality niche based content if you want to thrive well in 2019. You can even think of getting deeper and still build a huge business. And, there have been biggest examples who did the same and attained outstanding results. For example, if you just take Examine.com into consideration then you would notice that they built a 7-figure business just by selling the reports on fitness problems. Just think!! Why can’t you do so? The answer is probably you’re not being specific enough and trying to be generic with a hope that you could connect to more viewers. But, that’s not the reality! Well, this is nothing but the ultimate result of market saturation and maturity. 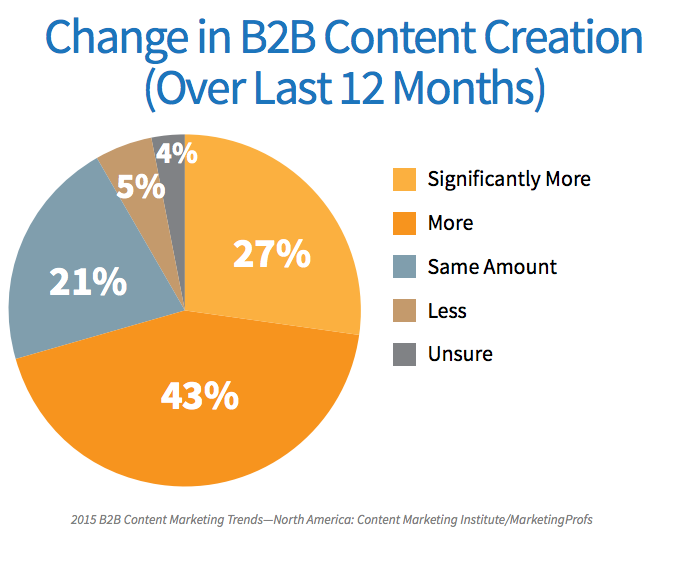 Marketers tend to create tons of specific content than even before. According to one Kapost survey, 70% of the marketers said that they are mainly creating significantly more specific contents than before. As per the Gartner’s predictions, we’re gradually proceeding towards the world of screen-less search and the reason behind such an anticipation lies in the fact that the digital world is more about voice search now. You might even say that this kind of prediction seems to be somewhat conservative. Well, voice searches have already made up to 20% of the entire Google searches on mobiles. Even more, it is expected that the young generation who would be the prospective customers of various online businesses are likely to use nothing else other than the voice searches. So, it is quite possible that contents are more likely to get adapted to natural language research in the rest of 2019. The study underlying this fact states that 71% of the population who fall under the age-group of 18-29 years are using voice assistants compared to no more than just 39% of the 44-53-year olds. No doubt, when it comes to marketers then it is quite evident that there has been always an arms race of sorts among them to create longer and longer contents all the time. This seems to be quite a productive idea if you want to eventually rank better in the SERPs. If you just take a glimpse of the Orbit’s survey of 1,000 bloggers then you would find that the average length of blogs is being risen over the years. And, I must specify that such an increase isn’t accidental at all!! The longer contents do rank better in the SERPs, according to the study by Backlinko’s. But, if your target market is millennials then you are more likely to expect a better ROI when your contents are shorter and obviously visually enriched. So, it is being predicted that we will soon see a ‘return to roots’ as marketers will give up the tendency of creating longer, and fluffy contents and rather they would choose to curate shorter, and bite-sized contents that people actually prefer to read. So, don’t think that each and every keyword or topic needs a 2,000 words blog-posts. Rather, be practical, and go for only 200 words if the topic can be communicated perfectly with such a length of an article while accompanying a relevant image or video with the same. According to a study by B2B buyers, it is ensured that millennials prefer to go for videos and infographics (59%) for making varied decisions while the other kind of buyers opts for in-depth whitepapers (78%). Consumers are simply growing tired of brand advertising! The customer from all genres have supported transparent companies instead. Also, the old tactics of proving themselves as transparent by various brands will not even work anymore! “With each passing day, it is really becoming tougher to pull the wool over people’s eyes by trying to create meaningful brand love with disconnected causes-as it should,” says Jim Moriarty, Director of Brand Citizenship. So, in 2019, you, as a yet another brand, you need to go even more forward and be genuinely transparent. And, what could be the best way to do that? Of course, it can be creating the best kind of contents which specifically signify an ultimate authentic feel. It’s because a writer’s pen can create a huger impact on the minds of audiences rather than any other advertising strategy. Isn’t it? As per Digiday, if you simply claim that you’re green, or opt for some remarkable brand-advertisements, corporate support, and rather give away a charity then it won’t be enough. Further, the Global Trust Advertising Survey by Neilson of 2015, has even shown that consumers are placing their trust more on content-based advertisements. It is quite sure that videos will continue to rise in the years to come, and specifically in 2019! There has been seen a significant rise in traffic for such websites which seem to be visually appealing with videos. People like to read such contents which have videos incorporated into them and that ultimately make the whole website more lively. So, it is quite evident that the scenario is going to be the same in the coming time. People will definitely continue to love watching videos rather than simply reading. Cisco did an estimation long back that by 2017 videos tend to account for 69% of all consumer internet traffic. So, now, it is 2019 and do you, by any chance, think that the figures will go less? Never! It is going to go up and more up!! The experts are anticipating that video on demand contents alone is going to be three times by the end of this year. Moreover, as per the Outbrain survey, 86% of marketers are preferring an incorporation of videos when it comes to content marketing. All these what I have talked about could be certainly some of the trends and it is even possible that all such trends might not work in the same way as how it is expected. But, it is definitely an ensured fact that the experts have predicted such trends while keeping in mind the practical scenario of the content marketing market. So, if not all, at least maximum of the aforementioned trends are certainly going to do wonders! Just opt for them and see the difference.